Fred has been busy lately trying to get Megagear orders shipped in time for xmas. 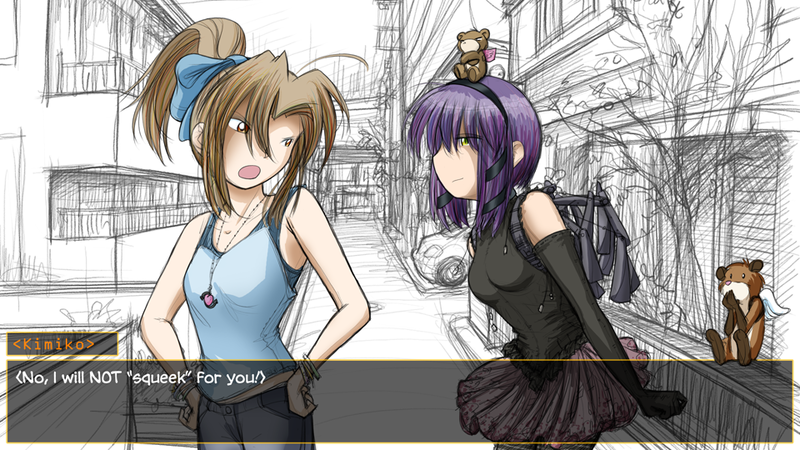 But he has had time to do a couple of comics and make some nice progress on the visual novel. 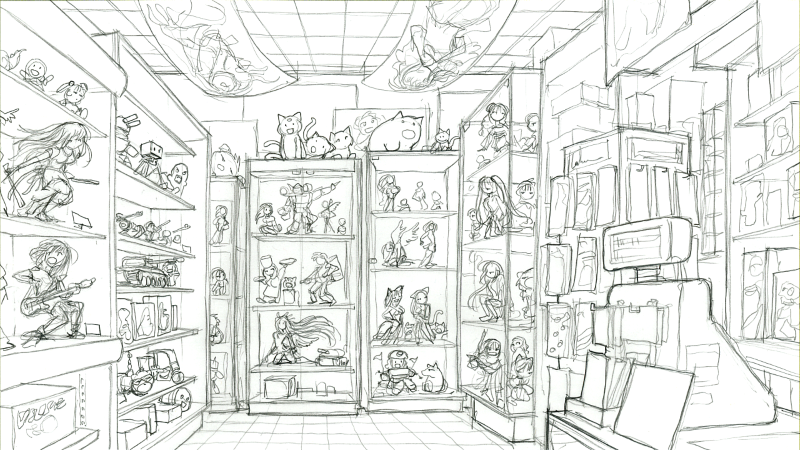 Fred drew the shop interiors for Piro’s shopping trip to Akihabara. The screenshot above is for the figure shop “Fig’s”. Piro will be able to buy some of the stuff in these stores, and some of that will have effects on how the story unfolds. Shadow has been busy making the purchase mechanism actually work in the game. 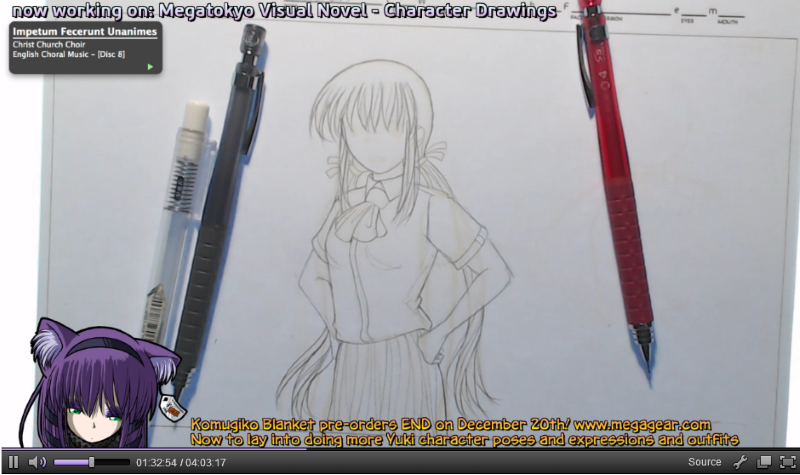 If you’ve been tuning in to Fred’s Twitch broadcasts lately, you’ve also seen him working on some core character art. Above is a typical Yuki body. With his light table, he’s able to draw new variations of common outfits and poses much more quickly by tracing previous variations and not having to start completely from scratch. 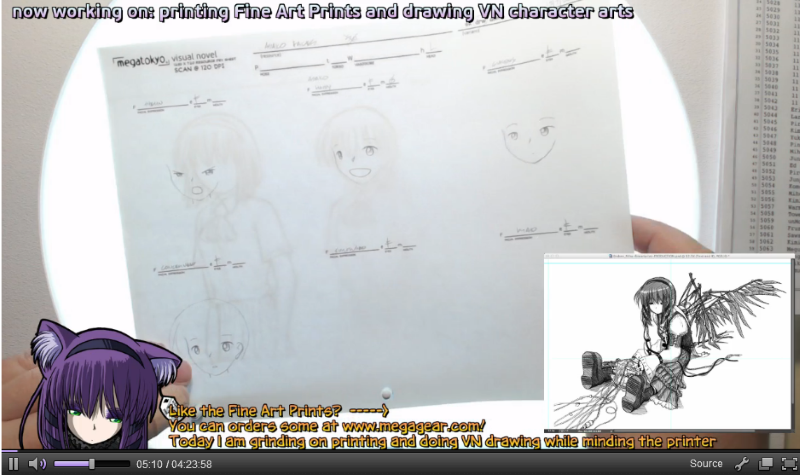 He has been drawing the faces for these core character arts separately, again using the light table. We’ll be assembling the bodies with the faces in Photoshop to create a number of different variations. He has finished Mami, Asako, Yanagisawa, and most of Yuki recently. So far we’re feeling good about this new approach to the character art. 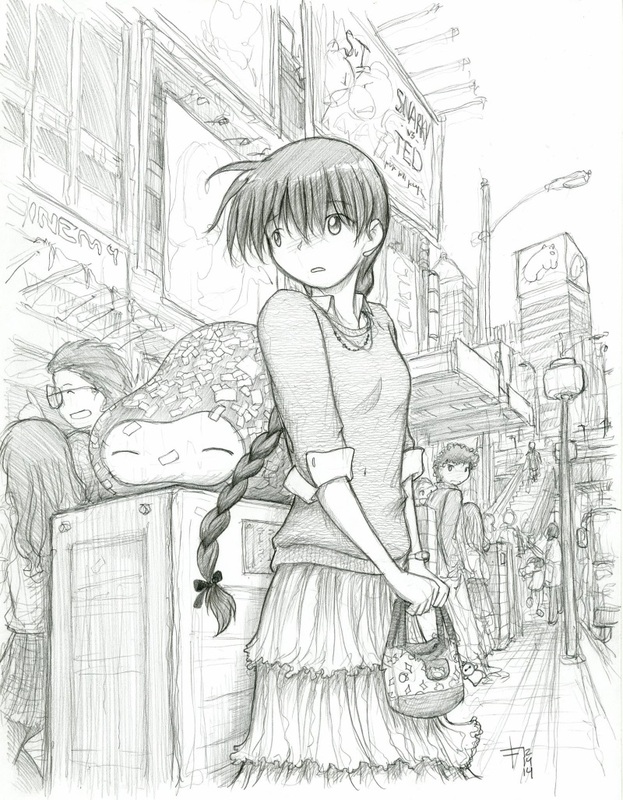 Fred has also been doing a series of development drawings for various characters, such as the lovely Asako above. This is part of the creative process for the alternative branches and routes in the visual novel, and perhaps for the core comic story. Fred comes up with a lot of his “writing” ideas while he’s drawing stuff. Some of these drawings will incorporated directly into the visual novel, and they’ll all be available as prints in the Megagear store. This entry was posted in Visual Novel on December 20, 2014 by paarfi. sounds like progress is going steady! and i like how you’re handleing the faces and poses, seems like it’s really helping! keep up the good work!